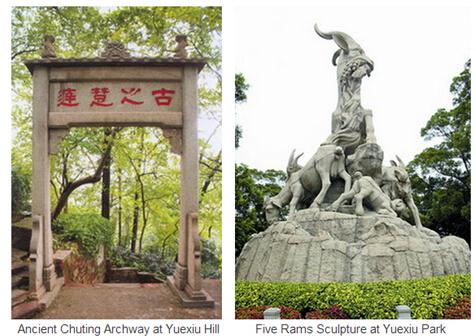 Yue Xiu Park: Most popular local park in Guangzhou; View city symbol -- Five Goat Statue; City Wall from Ming Dynasty; Zhenhai Tower ( Guangzhou Museum); Sun Yat-sen Monument. Sun Yat-sen Memorial Hall: is built to commemorate the contributions of Sun Zhongshan, the great predecessor of Chinese revolution for democracy. It is a memorial construction donated by the people in Guangzhou and the overseas Chinese and is listed as one of the first class cultural relics in Guangdong Province. Designed by the famous Chinese architect, Mr. Lu Yanzhi, the construction started in 1929 and finished in October of 1931. Western Han Nanyue King’s Tomb Museum: The tomb was discovered in 1983 and the museum opened in 1988. It is 20 meters under Xianggang Shan (Elephant Hill) in Guangzhou on a construction site for apartment and was excavated. 10,434 historical relics were unearthed including the Administrative Seal of Emperor Wen in gold. The seal proves the identity of the occupant of tomb to be the second king of the nanyue kingdom, Zhao Mo. Night Cruise On Pearl River: Pearl River displays both the modern culture and the historical legacy of Guangzhou City.Decorated by colorful shining neon lights, the bridges seem like fantastic rainbows spanning the river. It becomes gorgeous with a blaze of lights. The water in the river reflects the magnificent lights. Tourists enjoy the gentle cool breeze and soak up the colorful night on the cruise ship at a leisurely pace.